Palestinians have torched a Jewish holy site in the West Bank city of Nablus, amid soaring tensions with Israel. It came hours after Israeli PM Benjamin Netanyahu called on the Palestinian leadership to stop a wave of attacks. Palestinian leader Mahmoud Abbas condemned the arson and said the site would be repaired. Elsewhere in the occupied West Bank, a Palestinian disguised as a news photographer stabbed and moderately wounded an Israeli soldier, the Israeli military said. It said the Palestinian attacker was shot dead in the incident in the Jewish settlement of Kiryat Arba, next to Hebron. Violence between the two sides has spiralled, with near-daily stabbings by Palestinians of Israelis this month. Seven Israelis have been killed and dozens wounded in the stabbings and some gun attacks. At least 30 Palestinians, including several of the attackers, have been killed in the growing unrest. The upsurge began last month when tensions at a flashpoint holy site in Jerusalem revered by Jews and Muslims boiled over amid rumours Israel planned to relax long-standing rules to increase Jewish rights at the complex. Israel has repeatedly denied such claims. What is driving the latest violence? 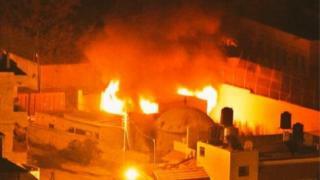 In the night-time attack in Nablus, dozens of Palestinians overran the tomb, attacking it with petrol bombs. Palestinian police dispersed the crowd and firefighters extinguished the blaze before Israeli security forces arrived. Israel's military spokesman Lt Col Peter Lerner said the attack was "a blatant violation of the basic value of freedom of worship". He said Israel would "bring perpetrators to justice and restore the site". Media captionPLO executive committee member Hanan Ashrawi accused Israel of "killing Palestinians with impunity"
Media captionMicky Rosenfeld of the Israeli police says the situation in Jerusalem is "relatively tense"
Mahmoud Abbas denounced the attack on the tomb as "illegal", adding that it "offends our culture and our religion and our values". This is not the first time the tomb has come under attack. Palestinians tried to set fire to it again last year and virtually destroyed the site in 2000 after Israeli guards withdrew amid clashes. It comes amid a major security operation by Israel to try to stop attacks on its citizens by Palestinians. Roadblocks have been set up in Palestinian areas of East Jerusalem, where many of the attackers have come from, and hundreds of extra troops will be deployed on the streets on Sunday. Hours before the attack in Nablus, Mr Netanyahu called on Palestinian Authority President Mahmoud Abbas to stop what he said was incitement to violence. Mr Abbas has said Israeli occupation of Palestinian areas and "aggression" is to blame for the unrest. Meanwhile the UN Security Council is to hold an emergency meeting on Friday to discuss the upsurge of violence. The US Secretary of State John Kerry has said he planned to travel to the region in the next few days, amid reports that a meeting may take place in Jordan to include the Israeli and Palestinian leaders. Are you in Nablus? Have you been affected by the issues in this story? You can share your comments and experience by emailing haveyoursay@bbc.co.uk.